Home Other Topics What are Off-Balance Sheet (OBS) Items? Also known as Off-Balance sheet items, Off-Balance sheet assets or liabilities, and Incognito Leverage. They are either a liability or an asset which are not shown on a company’s balance sheet as the business is not a legal owner of the respective item. Off-Balance sheet items are generally shown in the notes to accounts along with the financial statements. These assets and liabilities may be used by a company; however, the legal ownership may or may not belong to them. In this case, the consumption of assets and payment of liabilities may ultimately be an indirect responsibility. The term is very common with asset management companies, brokerage firms, wealth managers, etc. In this case, the assets being managed by firms do not belong to them but to the clients, so they are not recorded on the balance sheet. 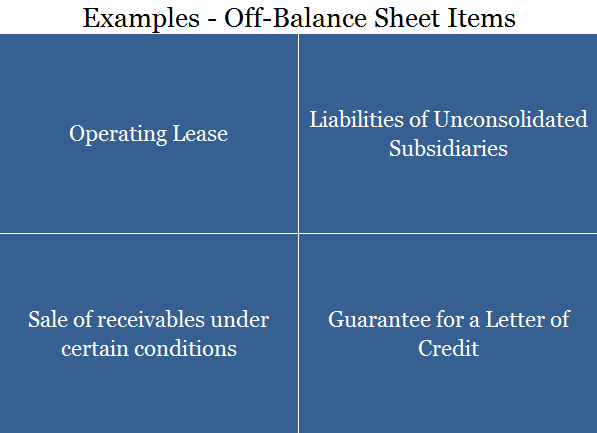 Contingent liabilities are different from off-balance sheet items as the former is only mentioned when the liability is likely and the obligation can be quantified. Often the companies use it as a type of creative accounting to pump up their accounting ratios or to avoid breaking a commitment made to lenders with respect to the total amount it may borrow. Legal entities or special purpose entities are usually created as subsidiaries. Real life example – Unreal Corp. raised a loan with a Lender X on a condition that their debt to equity ratio would not increase, however, during the tenure of the loan the company might need new heavy machinery for which it may not have enough cash. In such a scenario the company may create a special purpose entity (SPE) and let the SPE lease it back to the parent company. To avoid window dressing the accounting profession has always tried to reduce Off-Balance sheet objects to ensure more & more transparency. In the USA, SOX (Sarbanes-Oxley Act) was introduced in 2002 to stop scandals arising out of any such loopholes.